How to choose and create the perfect info product for your business that generates new leads. What goes into a high converting sales page. How to build your sales funnel from scratch to make sure it's converts. You are here because you are at a point in your business where you are frustrated because your business is not where it’s suppose to be. The vision that you had for your business is being tested and you are questioning whether you are growing your business the right way. Like many things in life if you want to see results from marketing, you need a strategy. Simply building content just isn’t enough. Simply having a website just isn’t enough. Simply having products or your offerings just isn’t enough. Simply having social media just isn’t enough. You need to make sure you have a way to drive traffic to your content, website, or product. To survive every real business needs visibility and customers. 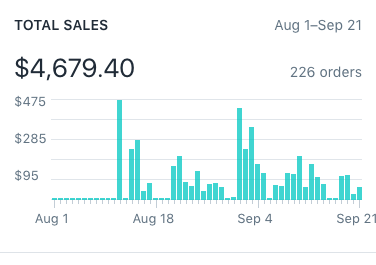 What if you had an entire system, a way of thinking about how to level up your business through funnel building, ads, and strategy. You'll learn exactly what you need to know to get your offer in front of your perfect audience. The Ad Prep Academy is a membership site designed to give you a clear step-by-step process to GROW and SCALE your business to the next level. After registering, you’ll have access to all of the courses in the Academy. 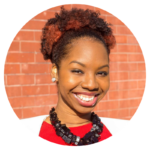 “My biggest challenge was figuring out how to use ads in my marketing strategy to automate my funnels. I was able to gain clarity on how these would work into my existing strategy. I felt relieved after getting insights into Abu's best strategies which would help me generate over 700 new leads for my Freebie, 'The Financial Success Bundle'." “This is worth way more! I can't believe you're selling this at this price point. I got my first ad up and running in less than an hour and I already have people signing up. I would highly recommend this program to anyone looking to market their business. There's no clutter, easy to follow and you literally guide us step-by-step." Over 740 new leads in 30 days! The Ad Prep Academy is a complete system that teaches you how to grow you business on social media by focus on revenue generating activities in your business. There is a focus on using Facebook and Instagram ads to drive visibility and sales to your brand, as well as, other activities such as email marketing to grow your business. Step-by-step training modules that will walk you though everything you need to know (landing pages, ads, email sequences, etc.) to get your brand the visibility it deserves. Training modules come with templates and workbooks to follow along so you are getting the most out of your learnings and ready to implement in your business. If you’re a business owner and not using Instagram Ads, you’re leaving money on the table! Venturing into the land of Facebook & Instagram ads can feel a bit daunting. It’s something new and something that often takes some time to learn. Knowing where to start can be a great help, but it can also bring up more questions. I just want you to know that this is completely natural. Every time you encounter something new, you’ll feel like you’re in a maze that at the moment you struggle to get out of. 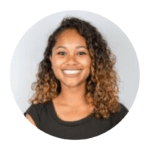 "When I started working at Facebook, I had very little experience setting up campaigns and understanding ad strategies and metrics. It was important for me because I work with Facebook's partnered clients. After working with Abu, I felt much more confident about my campaign creation skills and more importantly, how to measure and understand an ad campaign to bring it to success. With his guidance, we walked through the Facebook ad creation system and I learned how to properly set up a campaign, ad set, and ad. He also provided me with ad creation best practices that were also useful. The ads that I set up with his help were successful and resulted in an increased event attendance and brand awareness for my clients." You are unsure how to best use ads to compliment your existing funnel. You are unsure where to best utilize ads to make sure you’re maximizing the amount of money you’re spending and getting a significant return. You've tried ads in the past but had no success. The truth is you’re unsure where exactly to start when it comes to running ads or how to know if it’s working. You've had a bad experience with someone who claimed to be a Facebook ad consultant. You feel like you’ve wasted enough money already by bringing a third party in to run ads but you didn’t see any returns on investment. You've spent hours researching the best way to run ads. You find yourself way too often searching for answers about running Facebook and Instagram ads. More then often you feel like you’re not getting anywhere. You’ve heard of ads and what it can do for the growth of your business but as soon as you begin you’re so lost. You need guidance and clarity. You are unsure if your ad is working or if your funnel is converting. You spend hours on your landing page only to not know if your ad is working or not. The truth is... Facebook and Instagram ads are only as EFFECTIVE as the strategy and funnel behind them. Without it, you will continue to just throw money out the window runnings ads without any returns. Because once you learn HOW to create the right strategy and build an effective funnel your ads will begin to work for you! You’ll be able to understand what it takes to build a successful marketing campaign and be able to apply it every time you launch. If it’s falls outside of your strategy or funnel you can consider it not worth your time and instead focus on adding new ads to your funnel. Learn how to create an ad funnel that will drive new leads for you on autopilot. As you get a better understanding of how to best leverage ads for your funnel and business strategy you’ll begin seeing your costs decrease. Use ads to your advantage by boosting your online sales of your store or products and services that you offer. Learn how to position your business to sell on both Facebook and Instagram. Get insight into why Facebook is the most cost effective platform to advertise on and how to do it in a way that grows your business. Learn where to place your PIXEL so you can track how many people are clicking your ad and if that actually drove traffic to your website. Get a better view of which ads are converting and which are not providing any returns. Learn what you need to know in the Facebook Ads manager so you can get your ads up and running without spending too much time boggled down by all the options available. Learn some of the tricks I use to get client ads up and running quickly and efficiently. Stop getting stuck when it comes to what to say to your audience.Know EXACTLY what to say each time. Learn how to craft a clear message that will resonate with your audience. We’ll go over how to create ads that ONLY target people who will most likely become paying customers or clients. This is how you keep your marketing budget low and your conversion rates high. 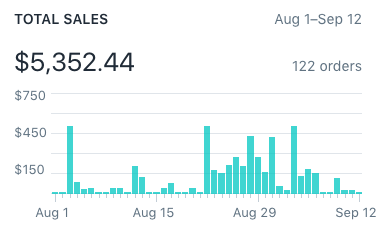 Trying to target people who will never buy your products will lead to a lot of stressful days. Learn how to craft an ad strategy and funnel before even running your first ad to give yourself the best chance at success and creating an automated sequence. Understand how to read your funnel to make sure it’s converting. How do you know your funnel is working? What if you had a system in place to help you identify and get in front of keeping your budget in check so you’re making money for every dollar that you spend. Learn what type of offers work to generate leads and which offer will help you get more purchases by implementing this step before you ask your audience to buy from you. 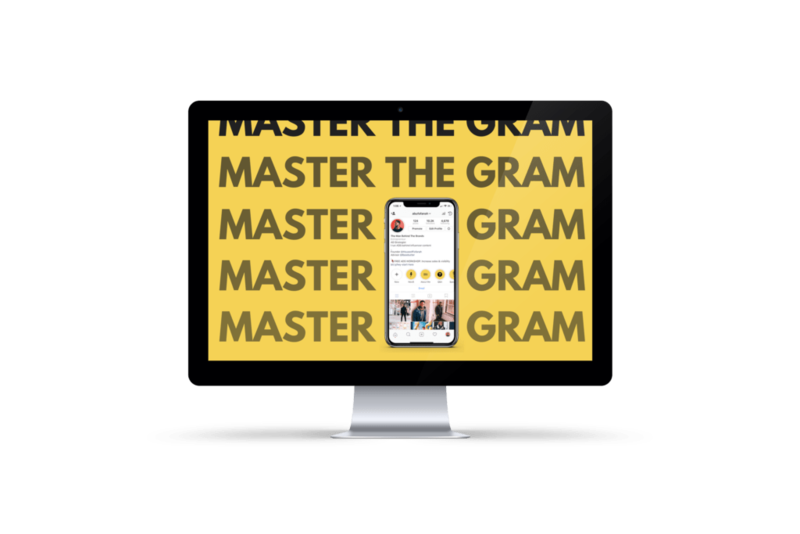 Learn how to turn your Instagram into a sales machine as a business owner. Here you’ll learn strategies on how to position your brand to your audience, how to turn your profile into a lead magnet and sales machine. 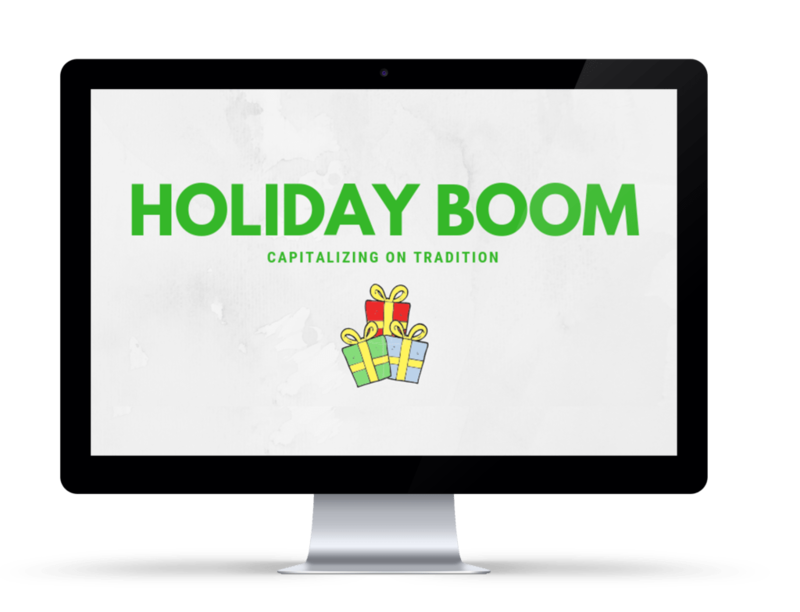 Learn how and when to start creating your marketing campaigns for the holiday. This course is filled with strategies to help you BOOST your sales during the holidays. Enroll now for instant access to all 8 modules. We’re ready to show you behind the curtain so you can grow your traffic AND make more sales through the power of Facebook & Instagram ads. 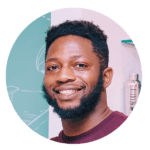 Hi, my name is Abu and I’m a Growth Strategist that teaches entrepreneurs how to grow and monetize their business (coaches, courses, consultants, product/service) on social media. I’ve helped hundreds of students grow their business by using social media to attract, find, and promote to their customers. 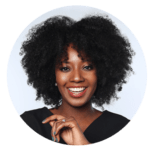 Since the cost of working with me one-on-one is a few thousand dollars I created the Ad Prep Academy to be more affordable to upcoming business owners. You still get the same quality in the content for a fraction of the cost. The course is available IMMEDIATELY after purchase! 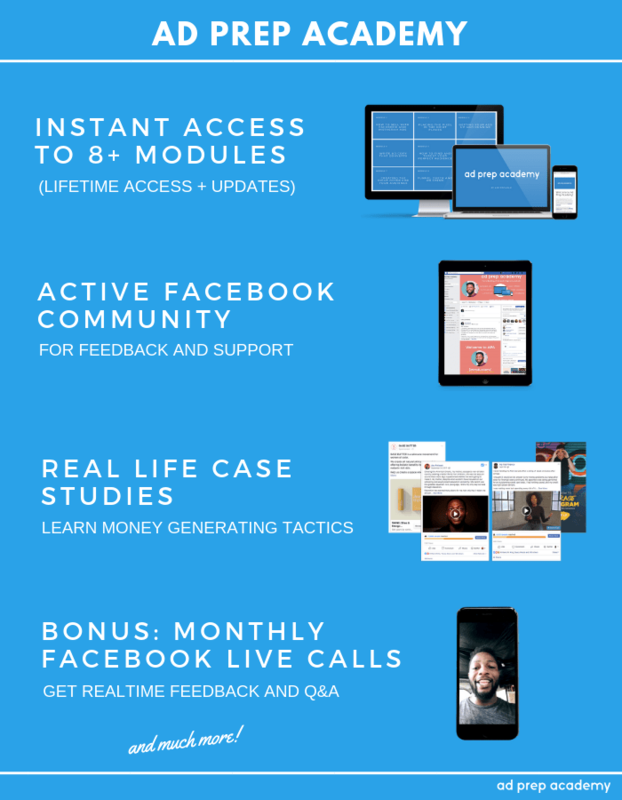 You’ll get FULL access to the course right away so you can start digging in and running high performing Facebook and Instagram Ads as soon as TODAY! On top of that, you also get IMMEDIATE access to all of the bonuses! Beginner, intermediate, or advanced business owners who want more traffic so they can grow their email list, sell more product, or command higher rates when working with brands. Virtual assistants or social media managers for influencers. Give your clients a traffic boost by learning tried-and-true Ad strategies. You’ll help them grow their audiences, boost their income, and generally find you indispensable. Just because you’ve tried them doesn’t mean you knew what you were doing. Like anything in life, with more information you tend to perform better. With Ad Prep Academy, you’ll identify exactly what the problems were and how to fix them. You just need to tweak your strategy. This sounds intense, maybe I should just hire a FB Ads Manager instead? Is this course up to date? This course will ALWAYS be up to date. This is my baby! Facebook and Instagram are constantly changing daily so it gives me plenty of new material to work with year after year. You can count on me to keep updating the course for a good while. Can you guarantee that I'll be a millionaire after taking this course? No I can not! I don’t own the platform Facebook or Instagram. As it constantly changes, I will continue to give you the tools to be successful. I’m constantly learning and tweaking my own campaigns as the platform changes. It's not the right time for me / I'm too busy / don't have the time. Yeah I bet you don’t have the time because you’re doing a whole lot of other stuff you don’t need to be doing. The whole point of this course is to show you how to use your time effectively, by utilizing automated systems – Facebook Ads – so you no longer have to spend hours on social media, blogging every week, or doing whatever other self-promotion you’re currently doing. It’s your shortcut to growth. And then? You’ll have ALL the time in the world and you’ll be using it on things you LOVE doing. That’s why I created this program. I have more questions about the course, how can I get ahold of you? We want to make sure you make the best decision for you and your business. Simply shoot us an email to support@houseoffofanah.com with the subject line “Course question” and we’ll get back to you to answer any and all questions you may have ASAP! Well, you can string together a bunch of people’s strategies and give it a shot, but here’s the thing. There’s SO MUCH bad advice about Facebook ads out there. We see it daily, especially in Facebook groups. Since I work directly with Facebook ads for my day job, I get the truths to the myths and always make sure you’re in the know. I'm not ready to do this now. Will this be available at a later date? Yes, the Ad Prep Academy will be available at a later date HOWEVER it will be at a higher price then what you see today. Additionally, I don’t recommend waiting. Facebook Ad costs will rise, more and more people (your competitors!) are using Facebook Ads and the longer you wait, the less advantage you have to make this into an ULTRA effective tool, faster. Stop waiting around, dig in, and create the results you’ve been waiting for. It’s time. Learn How to Build a Funnel, Create Your Facebook & Instagram Ad Campaigns, & Monetize your Offers. You know if you could just figure out Facebook and Instagram ads you can GROW your business quickly. But you're not 100% sure WHERE to start or HOW to make them work for your business. You have a lot of questions and can relate to any of the following..